The microbrewing scene around Hobart continues to expand at a quite phenomenal rate, with Shambles in North Hobart the latest to open its doors to the public. But don't let the name fool you: this is no ramshackle, tinpot operation. 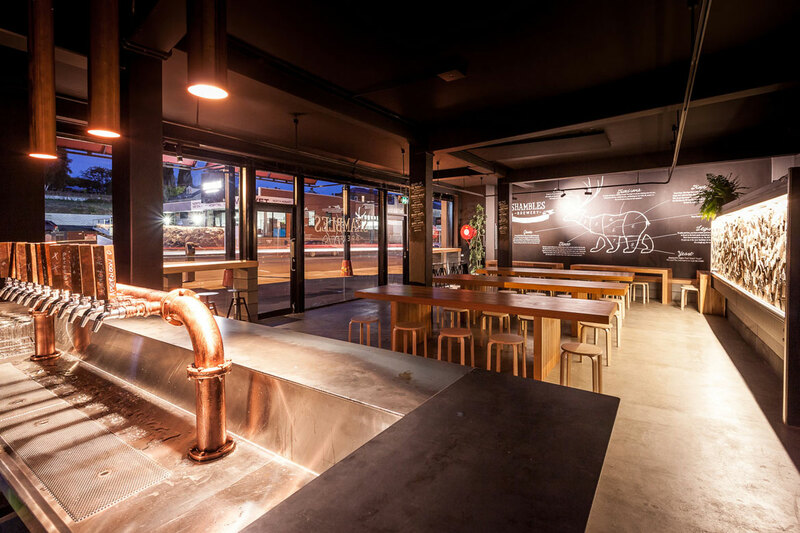 Rather, the Elizabeth Street brewpub is one of the most polished you'll find. While "shambles" has taken on meanings along the lines of messy or chaotic, it has origins in the world of meat markets. And, as the brewery is in a warehouse owned and previously occupied by Mundy’s Butchers, it's a wholly appropriate moniker. Shambles has been launched by a pair of keen homebrewers – former science teacher Cornel Ianculovici and aeronautical engineer Bruce Arnold, who relocated from Canberra to work on the project – alongside bar manager Adrian Ianculovici and Nick Blacklow, who's handling the finance and distribution side of things. Today, while he now works amid gleaming copper and polished timber surfaces, Bruce admits that the name could have been used to describe the state of the warehouse when the Shambles team moved in. The connection with the site's former occupants goes beyond the name. 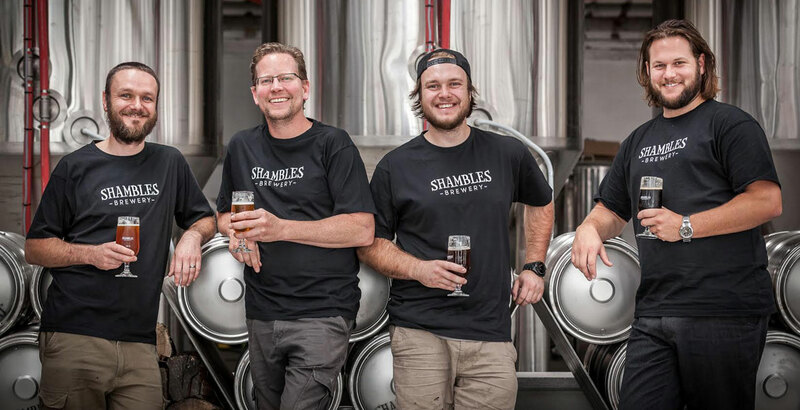 Shamble's chef Patrick Anderson, well known for his Pato the Waffleman food stall that you find at local markets and events, sources his meat for the brewpub kitchen from Mundy’s while Shambles provides Mundy’s with its spent grain for feeding cattle. Furthermore, one of the items salvaged from the pile was a stag’s head, which is now mounted on the wall of the brewery. As for the new look they've given to the space, it's come from a couple of friends: one an architect at Hobart-based Room 11 and the graphic designer who has produced the Shambles signage and print items. “We really just trusted people to do their jobs,” says Bruce. “The architect walked into the space and immediately started planning. They had a grand concept which I couldn’t see at all, but I trusted them to see their vision through. With planning and design complete, and the doors open, the focus for the team is now on perfecting its beers. First to come from the 12 hectolitre brewery are four core beers: Afternoon Delight (4.3 percent ABV) is a citrusy summer ale; Dirty Copper (4.8 percent ABV) is an easy-drinking amber ale; Dances with Hops (6.4 percent ABV) is an intense American style IPA featuring five different hops; and Barry White (6.6 percent ABV) is a dark, robust porter. For the official launch earlier this month, there was also a Saison, named NoHo following a reader competition in the local newspaper. “We’ve had great feedback on all four beers that we’ve got on tap,” says Bruce. “We’ve been serving them at the brewery, but also up at the Esk Beer Fest, and at Saint John’s in Launceston. Saint John’s has run out of the IPA and they’re about to start serving the Porter. With an increasingly educated drinking crowd in Tasmania and the feedback and support of other local brewers, Bruce is confident that they will continue to develop strong products that can hold their own. “There’s just been a revolution in North Hobart in the last five or six years. It’s like inner west Sydney, but on a smaller scale, and it’s really good because that density adds to the appeal of the Beer Trail. "The support we’ve had from other local brewers has been overwhelming; whether it’s popping in for a taste and to offer some advice, or letting us use some of their products when we’ve run out of ours. We even had other guys helping us put our stall together up at Esk when we were delayed getting there. Cornel is equally confident that even a city as small as Hobart is well capable of sustaining current growth levels. “It may seem like this is all new, but the increase in the number of breweries going on just now is really just a return to the past. There were times when Hobart had a much smaller population, but four times as many breweries. With an impressive venue that is already drawing in big crowds as well as plans to build a second bar and kitchen later in the year – along with a new bottling plant – the team behind the brewery is thinking well ahead to ensure they keep momentum going. A Shambles they may be, but in name only, not in nature. Shambles Brewery is at 222 Elizabeth Street, North Hobart.